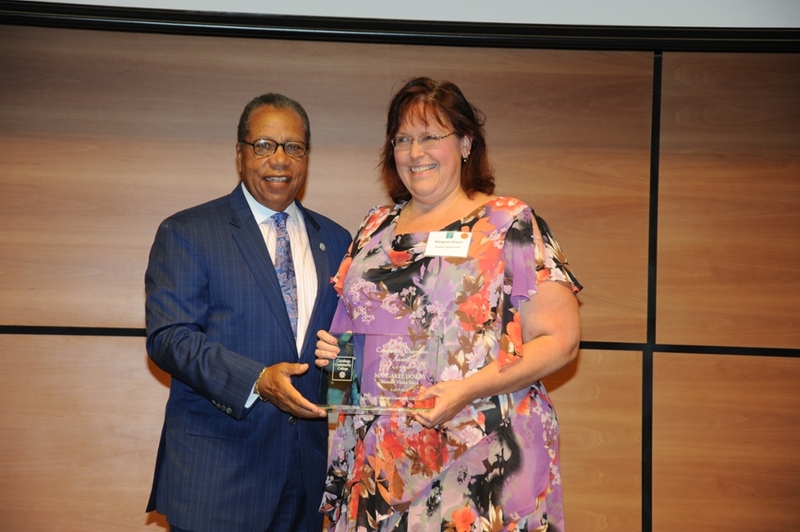 Margaret Downs accepts the 2016 Community Champion Award, Small Business category from Dr. Alex Johnson, president of Tri-C.
Margaret Downs, a 2011 Tri-C alum, was named a Community Champion in the small business category at a recent College-sponsored Advisory Committee Appreciation Breakfast. She is the owner of Premier Visual Voice, a business she runs from her Concord Township home and that, in some respects, was inspired by her time at Tri-C.
Premier Visual Voice employs 10 people — some of whom are Tri-C grads — who voice write, or caption, webinars, conferences, classroom lectures, government meetings and even quarterly financial updates for a Fortune 500 company. Employees can generally work from home, and the clients can be located anywhere in the United States. Voice-writing is a stand-in term for the clunkier Communication Access Realtime Translation, or CART. In addition to the applications listed above, it also serves the hearing-impaired community, as talk is translated in real time into a written transcript that can be viewed online. Downs attended a business college, worked in sales and pursued other entrepreneurial ventures until failing vision limited her ability to drive. She worked on plotting her next move, and in 2009, she enrolled at Cuyahoga Community College after learning about its transcription certificate program. She is now working toward an associate degree. “My listening skills are great because my vision is not. The course was available online so I could work from home. It just fit,” she said. Voice writing is conducted at a computer, talking into a microphone connected to software. The software translates spoken word into text on the screen, complete with appropriate punctuation and paragraph breaks. While there are sometimes small errors, the new technology is nothing like the old closed captioning, which would show up on television decades ago. The software and training get the practitioner started, but Downs stresses that practice really does lead to perfection. Downs knew she had found her niche, and the success of her business is proof positive. She now sits on one of Tri-C’s community advisory boards, and she has made it a point to hire or offer internships to Tri-C students when the opportunity arises. Downs said her experience with the staff and faculty of the CART and Captioning program was outstanding, and her involvement with the advisory board is aimed at facilitating internships and helping students be better prepared. Case in point: At the recent Advisory Committee Appreciation Breakfast where her company was recognized, in the audience, unnoticeable unless you really looked, was Tri-C graduate Jean Cregan captioning her alma mater’s event. Check out Downs story in Tri-C Times.